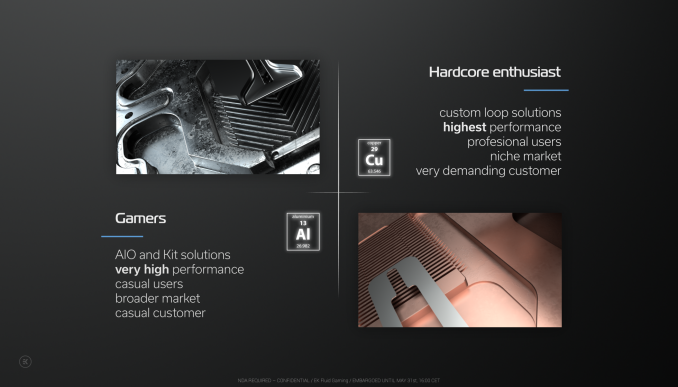 EK Water Blocks revealed the Fluid Gaming series of full loop water cooling kits during Computex. 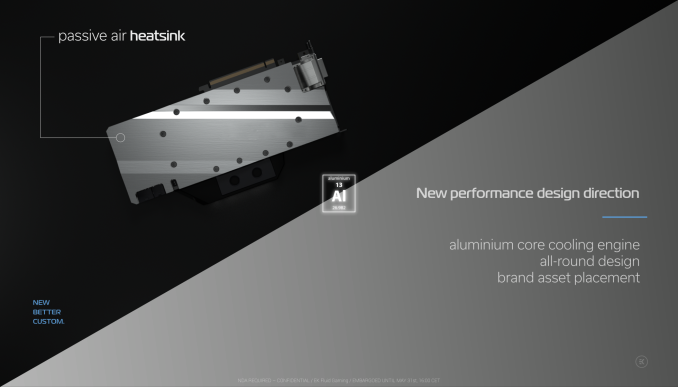 EKWB’s new water cooling lineup is designed to further augment their product stack, offering a cheaper option for mainstream water block users. EK Water Blocks offers a wide range of water cooling products including reservoirs, radiators, pump tops, fittings, and, of course, water blocks. With its all-encompassing portfolio of water cooling components, the company is also able to offer bundle packages to bring the cost down for newcomers to the water cooling scene. 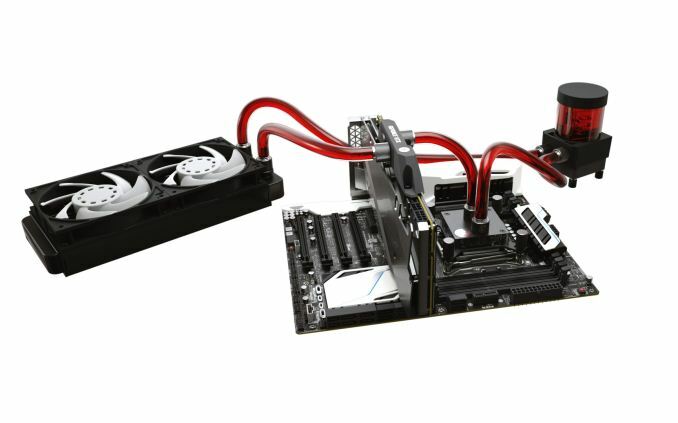 EKWB offers kits that include all the parts you need to build an open loop water cooling setup. The cost however isn’t cheap. EKWB’s boxed water cooling kits range from almost $200 to nearly $400. And that doesn’t include a GPU water block. EKWB recognized that water cooling would always be a niche market at that price range, so it decided to do something about that. The company revealed the EK Fluid Gamer series of full-loop kits, which are available for as little as $150. EKWB traditionally uses electrolytic copper to build its water blocks, and more often than not, it opts for nickel-plated copper. The use of high-end materials such as those ensures a high-end product, but they also necessitate top-tier price tags. While designing the Fluid Gaming series, EKWB ditched the copper blocks in exchange for aluminum, which is more affordable and easier to mass produce, which allows the company to keep prices down. The tradeoff of course being that aluminum doesn’t conduct heat as well as copper. EKWB offers the Fluid Gamer series of full loop systems as complete kits, and in fact that’s the only way to get Fluid Gamer parts for the time being, as you can’t buy them individually. The company said the new kits are expandable, but you’ll have to wait for new components before you can expand your loop. Meanwhile it should be noted that the Fluid Gamer’s aluminum parts aren’t compatible with the rest of EKWB water cooling lineup. Copper and aluminum are subject to galvanic corrosion when used together, so parts made from them start to corrode when introduced to the same water cooling loop. EKWB said Fluid Gamer-compatible components would be available in the future to expand and upgrade your loop, but the company is offering only full kits for now. The Fluid Gaming series kits feature an aluminum EK-Supremacy AX CPU block with a universal mounting system that is compatible with “all modern CPU sockets” from both Intel and AMD. The kits also include 28mm thick EK-AluStream SE radiators to dissipate the heat that your loop picks up. Of course, EKWB’s previous lineup of copper fittings wouldn’t work with the aluminum parts in the package, so the company includes a set of EK-ACF ALU fittings. The Fluid Gaming kits also include EKWB’s SPC series pump with integrated reservoir. The company rounds out the kits with a length of EK-DuraClear transparent tubing and a bottle of clear EK-CryoFuel coolant, which you could dye to any color you prefer. EKWB is offering the Fluid Gaming series in three different kits. The EK Fluid Gaming A120 kit, which features a 120mm radiator and CPU block, will hit the streets at $149, Meanwhile the EK Fluid Gaming A240 kit, which offers a radiator twice the size, will go for $10 more. EKWB also revealed the EK Fluid Gaming A240G, which includes a universal GeForce GTX 10-series full-cover GPU block that fits all Founder’s Edition 10-series cards, including the Titan Xp. The aluminum full-cover GPU block features a design that is unique in the EKWB lineup. It doesn't come with a black Acetal top, and you can't get it with a clear acrylic window. The Fluid Gaming series GPU block features a stylized black aluminum faceplate over a solid aluminum cooling block. The aluminum GPU block features EKWB's new terminal block design. The EK Fluid Gaming A240G is available for $239. Most full cover GPU blocks alone cost $120 or more.